We’d love your help. Let us know what’s wrong with this preview of 18 Steps to Own Your Life by Keith McArthur. Do you need a guidebook for life? You’re not alone. Most of us struggle with how to be happy and healthy, have amazing relationships, and achieve our biggest goals and wildest dreams. But after a brush with death and a life-changing gift, author Keith McArthur resolved to learn how to be human. 18 Steps to Own Your Life is his blueprint. With easy, actionable tips on every Do you need a guidebook for life? You’re not alone. Most of us struggle with how to be happy and healthy, have amazing relationships, and achieve our biggest goals and wildest dreams. But after a brush with death and a life-changing gift, author Keith McArthur resolved to learn how to be human. 18 Steps to Own Your Life is his blueprint. With easy, actionable tips on everything from getting a better night’s sleep to connecting instantly with others, this is a concise but comprehensive instruction manual for a healthier, happier you. Published March 6th 2018 by FanReads Inc.
To ask other readers questions about 18 Steps to Own Your Life, please sign up. This book does exactly what it says on the cover. It is a well written and easy to follow life coaching book - ideal for anyone new to the subject. I loved this book. It's a short and quick read. The author shared many experiences from his own life. Keith McArthur divided this book in for parts and well explained those tiny steps everyone needs to follow to live a happy life. It's a good book to read. Applicable to anyone who wants to learn and know that time is gold. 4 stars for something short but hard to digest. Because some things are true but we are too stubborn to admit and do it. The book has much to offer as the author takes bits and pieces from other Books in the self help area. Which isn't Bad! He says clearly who wrote what and so on. So you can Check out anyone that interests you more. The Language was very easy to read. (I nearly got it down in One go.) I literally have nothing bad to say. Keep up the Good Work! 18 Steps for Your Own Life has to be one of the most practical self-help books I’ve had the pleasure to read. It’s a short but compact read, filled with nuggets of common sense, practical life tips that will make your life easier, happier and healthier. No gimmicks, no guff, just solid advice that makes sense. Author Keith McArthur breaks life down to 18 important categories where we can make vast improvements in our lives with small changes. He draws from his own life experience and also referen 18 Steps for Your Own Life has to be one of the most practical self-help books I’ve had the pleasure to read. Author Keith McArthur breaks life down to 18 important categories where we can make vast improvements in our lives with small changes. He draws from his own life experience and also references the writings of other well known self help writers, compiling the best information out there into one practical resource. He does not present himself as a guru, but as a human who has struggled with his own battles, both internal and external. He presents what he has learned from those experiences, what has worked for him and chose to share it with the world in the hopes of helping others. Each of the 18 steps are presented, expanded upon and followed by a list of the key takeaways at the end of each section. My personal favourite section was on sanctifying your space. Worksheets for the book will also be available, an absolutely fantastic way to stop and think about your goals and choices instead of skipping over to the next section. 18 Steps to Your Own Life is an excellent resource for anyone looking to change their life through their choices, habits, healthy mental and physical health and using your time more effectively. I have really enjoyed reading this book on changing your life. It is really well laid out. At the end of each chapter their are key takeaways to help you remember what you’ve read. I’m certainly going to put many of the ideas into action. To aid action and change the author has provided an abundance of bonus’s. A really good read. Practical advice without being over the top and preachy, with tips and suggestions to make positive changes in your life. Very easy to fallow . Was laid out great. And brought together things from other self help books all in one place. Enjoyed this and it clicked a few key points in place for me. That with other books where not 100% clear for me. Among the self help books this is one that provides advice without compunctions, helps you remember what it was, and affirms your right to ‘pivot’, to change when the context of your program changes in howsoever small a way. Refreshing. This is a self help book that suggests simple ways to improve your life. Making reasonable goals is simplified and this book has inspired me to make some small changes that should downsize those things that have bogged me down. Pretty nice book, learned bunch of new stuff. I will recommend to anyone looking to change. Thank you to Author. 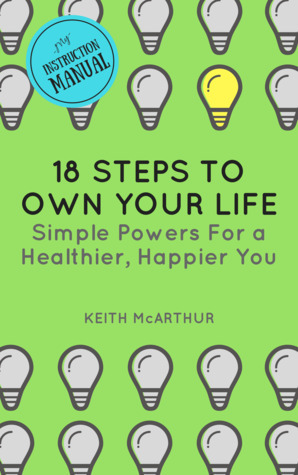 18 Steps to Own Your Life by Keith McArthur is a self help manual that combines the wisdom and knowledge from dozens of other experts in the field and expertly organizes this information into an easy go-to type book written from the heart. This would be a great book to read and keep for future reference as life throws us twists and turns throughout our lifetime. The title. I really thought 18 steps was going to be a three hundred page novel and I would never get to "Own My Life, 18 Steps to Own Your Life by Keith McArthur is a self help manual that combines the wisdom and knowledge from dozens of other experts in the field and expertly organizes this information into an easy go-to type book written from the heart. This would be a great book to read and keep for future reference as life throws us twists and turns throughout our lifetime. The title. I really thought 18 steps was going to be a three hundred page novel and I would never get to "Own My Life," but I was wrong. It was short and to the point and more importantly, on point for owning your life, rather than letting life own you. I really liked how he wrote this book out of compassion. The author spells out a time in his life that forced him to look at life differently if he wanted to live, and the words are written out of true encouragement and hope, something deeply contagious. He spells out clearly the human instinct to cling to what we know, when letting go of some of those preconceived notions or tightly held illogical beliefs is freeing beyond compare and sometimes a much healthier choice. I liked how well the book is organized. There are easy go-to pages arranged by physical must-haves: diet, exercise, sleep and hydration. There are chapters labeled by relationship goals in marriages, healthy friendships, and work. There are still other chapters grouped by existential life oriented decisions: what are your values, habits, choices, priorities, hopes, aspirations and ambitions? All areas we need to routinely explore in order to own our lives and not let life run away with us. In 2017, I got a second chance at life when my sister donated one of her kidneys to me. I’m determined not to waste this precious gift. I'm exploring how to be happier, healthier and more productive at http://myinstructionmanual.com and in my new book 18 Steps to Own Your Life. I’m a writer and podcaster who has worked in journalism, public relations, social media and publishing. I live in Toronto In 2017, I got a second chance at life when my sister donated one of her kidneys to me. I’m determined not to waste this precious gift. I'm exploring how to be happier, healthier and more productive at http://myinstructionmanual.com and in my new book 18 Steps to Own Your Life.